Full of stunning photography, this travel pictorial and Philippines guidebook captures the soul of a tropical island nation. The Philippines: Islands of Enchantment captures all the marvels and excitement found throughout the 7000-island archipelago. 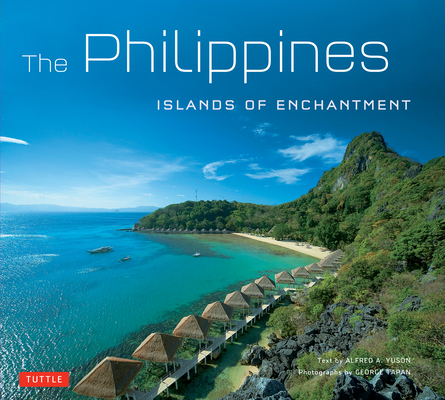 Beautiful photographs by award-winning photographer George Tapan are paired with rich text by author Alfred A. Yuson to make this new paperback edition a must for those that have traveled to this island paradise or just spend their days dreaming about going. Alfred A. Yuson was born and raised in Manila and has received numerous literary awards, including the South East Asia Writers' Award given by Thai royalty. He has authored 14 books and edited several anthologies. He has also been a travel writer, video documentary director, and film screenplay writer. He has chaired the Writers Union of the Philippines, contributes a weekly column to The Philippine Star, and teaches at Ateneo de Manila University. George Tapan is one of the country's most famous travel photographers. His work has been published in prestigious industry publications in the Philippines and abroad, and has garnered several awards including: Best Travel Photo Award from the Asian Tourism Association and Pacific Asia Travel Association, the Kalakbay Travel Photographer of the Year award from the Philippines' Department of Tourism and the Grant Award from Northwest Airlines for Best Destination Photography.